Crude oil or petroleum is an important fossil fuel. Fossil fuels were formed millions of years ago, when much of Earth was covered by water containing billions of tiny plants and animals. After these organisms died they accumulated on ocean floors, where, over the ages, sand and mud also drifted down to cover them. As these layers piled up over millions of years, their weight created pressure and heat that changed the decaying organic material into oil and gas. large quantities by ocean tankers, inland-water barges, or overland pipelines. Accidental oil spills can occur at any time during the loading, transportation, and unloading of oil. Some oil spills have been spectacular in magnitude and have caused untold environmental damage. Bioremediation is the use of bacteria and other living microorganisms to help clean up hazardous waste in soil and water. These microorganisms work by decomposing or breaking down toxic chemicals into simpler, less-poisonous compounds. Petroleum can be consumed by microorganisms, transforming it into compounds such as carbon dioxide and water. Unfortunately, the technique of adding bacteria to a hazardous waste spill in order to increase the rate of decomposition has yielded limited success. If a community of bacteria present in an area where a spill occurs can consume that hazardous waste, the bacteria grow rapidly. Adding further microorganisms does not seem to increase the overall rate of decomposition. More important, areas where spills take place often do not have optimum conditions under which the bacteria can function. Oxygen and certain nutrients such as nitrate and phosphate that the bacteria need are often limited. However, in the case of the Exxon Valdez oil spill in Alaska in 1989, nitrogen- and phosphorus-containing fertilizer was applied to about 75 miles (120 kilometers) of oiled beach. The fertilizer adhered to the petroleum residues. With these added nutrients, the naturally occurring community of bacteria broke down the oil at a 50 percent faster rate. Petroleum is a thick, flammable, yellow-to-black colored liquid containing a mixture of organic chemicals, most of which are hydrocarbons (organic compounds containing only hydrogen and carbon atoms). Since petroleum is a natural material, it can be diluted or decomposed by bacteria and other natural agents. The most toxic or poisonous components of petroleum are the volatile components (those compounds that evaporate at low temperatures) and the components that are water-soluble (able to be dissolved in water). The products refined from petroleum (gasoline, kerosene, asphalt, fuel oil, and petroleum-based chemical), however, are not natural. Because of this, few natural agents like bacteria exist to decompose or break them down. Since crude oil floats, oil spilled on the open ocean most severely affects seabirds. The oil coats their bodies, preventing them from fluffing their feathers to keep warm. 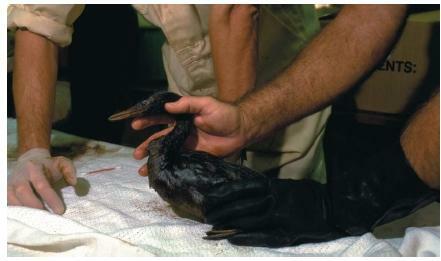 Animals and plants below the surface of the water are largely unaffected by the oil spill. Naturally present bacteria in the water begin to break down the petroleum, using it as a nutrient. Eventually, the oil slick is broken down into a hard, tarlike substance, which is almost completely harmless to seagoing life of all kind. Wave action then breaks the pieces of tar into progressively smaller and smaller pieces. These small pieces, often invisible to the naked eye, remain floating in the water indefinitely. When an oil spill occurs near a coastline, however, the damaging effect is much greater. Waves wash the oil on shore where it covers everything—rocks, plants, animals, and sand. If the wave action is high, bacteria present in the water are able to break down the oil fairly rapidly. In areas where wave action is low, such as in a bay or estuary, plants and animals quickly suffocate or are killed by toxic reactions to the oil, which remains for a considerable time. Since many small bays serve as nesting sites for aquatic birds and animals, spills in these areas are especially deadly. Accidental oil spills from tankers and offshore rigs are estimated to total about 250 million gallons (950 million liters) per year. In 1967, off the coast of southern England, the Torrey Canyon ran aground, spilling about 32 million gallons (120 million liters) of crude oil. In 1978, the Amoco Cadiz went aground in the English Channel, spilling over 63 million gallons (240 million liters) of crude oil. In 1979, the offshore exploration rig IXTOC-I had an uncontrollable blowout that spilled more than 137 million gallons (520 million liters) of crude oil into the Gulf of Mexico. The most damaging oil spill ever to occur in North American waters was the Exxon Valdez accident of 1989. The 11 million gallons (42 million liters) of spilled oil affected about 1,180 miles (1,900 kilometers) of shoreline of Prince William Sound and its surroundings in Alaska. The coastal habitats of many animals and birds were destroyed. Large numbers of sea mammals and birds were also affected in offshore waters. Of the estimated 5,000 to 10,000 sea otters that lived in Prince William Sound, at least 1,000 were killed by oiling. About 36,000 dead seabirds of various species were collected from beaches and other places. The actual number of killed birds, however, was probably in the range of 100,000 to 300,000. At least 153 bald eagles died from poisoning when they ate the remains of oiled seabirds. Large quantities of crude oil have also been spilled during warfare. The largest-ever spill of petroleum into a body of water occurred during the Persian Gulf War in 1991–92. Iraqi forces deliberately released an estimated 500 million gallons (1,900 million liters) of petroleum into the Persian Gulf from several tankers and an offshore taker-loading facility. Iraqi forces also sabotaged and set fire to over 500 oil wells in Kuwait. Before the fires were extinguished and the wells capped, an estimated 10 to 30 billion gallons (35 to 115 billion liters) of crude oil had been spilled. Much of the oil burned, releasing toxic petroleum vapors into the atmosphere. A potential ecological disaster arose in January 2001 when a tanker carrying 234,000 gallons (885,690 liters) of diesel and bunker (a heavy mixed fuel used by tourist boats) spilled the bulk of its load after it ran aground near the Galápagos Islands. The islands are located in the Pacific Ocean about 600 miles (1,000 kilometers) west of the country of Ecuador, of which they are a province. In fact, the islands are Ecuador's main tourist attraction. The islands are an ecosystem populated by species found nowhere else in the world. With their rare species of birds, reptiles, and marine life, the islands were an inspiration for English naturalist Charles Darwin's (1809–1882) theory of evolution. The tanker hit bottom 550 yards (503 meters) off San Cristóbol, the easternmost island in the Galápagos. Luckily for the islands and their species, strong ocean currents washed almost all of the fuel out to sea, where most of it evaporated. Only two pelicans were found dead on the islands, while dozens were soiled, along with several sea lions and pups and exotic blue-footed booby birds. According to experts, the contamination was minimal. They also felt there would be no long-term damage to the islands from the spill. I think this is very good work regarding to clear the oil spills That benifitised so many aquatic lives,and it also useful for controls the soil and water pollution.In the same way identify the specific genes responsible for degradation and cloned into normal organisms and then identyfy the capability of that organism related to degradation. I WOULD LIKE TO KNOW IF ANY OF THE OIL HAS BEEN CLEANED OR RECOVERED? Do you have any info on how oil spills affect plant life not just moss? who is the author of this site? im in 7th grade and i have to get the author of this site for my science project.